Born in Melbourne, Victoria in 1974, Lincoln McConnell-Brown began studying karate at 7 years of age, originally in the Gojukensha style. Throughout his years of practice, he attended classes a minimum of 3 times per week, but more usually 4 times, supplemented by private training at home. As there were no Junior classes, Lincoln trained with adults, at an adult pace, and therefore progressed through the grades quickly, achieving 1st kyu Brown belt at 11 years of age. He was graded to Shodan in 1990 at just 16 years of age, Nidan at the Inaugural GKMI Summer Camp in Bundeena NSW in 1994, Sandan in January 1998, at 24 years of age, and Yondan on 13th January, 2003. 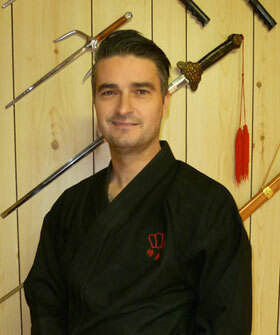 In 2005 the club left Sensei Watanabe’s school, and both Lincoln and his father, Graeme McConnell-Brown trained with Kyoshi James Sumarac, 7th Dan, Principal Instructor of Goju-Ryu Karate-do Kakurin-Kan, (in Australia, formerly Gojukensha). Shushinkai bcame independent from Kakurinkan in 2010, and is now a member dojo of Ichikawa-ha Goju-Ryu Karate-do Sosui-kai, under the instruction of Tsubamoto Sensei, (10th Dan) As a junior and teenager, Lincoln competed in many karate tournaments, accumulating eleven trophies for both kata and kumite (fighting). However, Lincoln’s major interest is the practice of traditional budo karate, and so has tapered his efforts away from the tournament scene to focus more on the spiritual, philosophical and personal development aspects of karatedo. Apart from karate, Lincoln has participated in a great number of sports, including District cricket for Essendon, basketball for Broadmeadows, Australian Football, soccer, baseball and tennis. His interest in sport in general led to him completing a Bachelor of Applied Science in Physical Education at Victoria University of Technology. This course exposed him to the rigours of studying and applying a wide range of sports related knowledge including sports psychology, biomechanics, nutrition, sports medicine, sports marketing, ethics and philosophy, anatomy, exercise and rehabilitation prescription and fitness training. The club is very fortunate in that Lincoln brings his expertise in these areas to his teaching of karate, and so blends modern science and knowledge with traditional martial arts practice. Previous employment as a police officer with Victoria Police has also helped increase the breadth of his practical experience. During and after his university studies, Lincoln worked as a Sports Trainer in the Australian Football League; for the Western Bulldogs, the now defunct Fitzroy Football Club, and as Rehabilitation Coordinator for the Western Jets. He was also a Melbourne based trainer for the Brisbane Lions during their premiership years and experienced the highs of being part of a premiership winning group and the lows of grand final defeat. His biggest challenge in his younger years was to successfully combine his study of karate with his school and university education, and his practical participation in a wide range of other sporting interests. He is a firm believer in the need to give total commitment, and to become an aggressive and effective time manager. Today Lincoln is a Licensed Real Estate Agent, and works as the Head of Asset Management for leading commercial real estate agents, CRS Property. He is a partner with this firm and mentors and leads a team of 11 on a daily basis. Lincoln’s personal motto is “Go hard, or go home”.